Originally posted on 29 September. Scroll down for updates. Autodesk has released 3ds Max 2018.3, the latest update to the 3D modelling and animation software, adding a new Fluids simulation toolset based on the technology used in Maya’s Bifröst. The update also adds a new multi-force Motion Field Space Warp for directing the output of fluid simulations; and the MAXtoA 3ds-Max-to-Arnold plugin has been updated to render 3ds Max fluids in Arnold. The update addresses a long-standing gripe in the 3ds Max community: its lack of a robust native fluid simulation system. 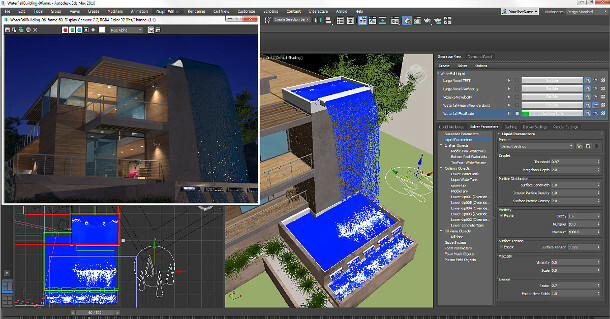 Users have been requesting Bifröst integration ever since the technology was first implemented in Maya in 2014: at the time of posting, it was still the third most popular request on Autodesk’s 3ds Max Ideas site. The new Fluids toolset is capable of simulating liquids of a range of different viscosities; includes a component for foam, bubbles and spray; and can be controlled by forces or guide meshes. Sims are multi-threaded, and process in the background, so they don’t tie up a machine while calculating. The toolset reads both Bifröst BIF files for “direct interoperability” with Maya, and VDB files, for compatibility with other pipeline tools; and can surface and export the simulation as Alembic meshes. To judge from the online documentation, Fluids doesn’t have all of the same functionality Maya users get with Bifröst, but it does incorporate Autodesk’s recent work on the technology. Update: Autodesk has provided more information on the differences. Scroll down to the foot of the story. One example is the new Motion Field Space Warp, which looks like it benefits from some of the work done on its Maya counterpart for Maya 2017. Unlike 3ds Max’s legacy forces, it unifies gravity, drag and turbulence into a single system – and, as well as directing Fluids simulations, can be used to influence conventional particle systems or meshes. The MAXtoA plugin, which links 3ds Max to the Arnold renderer, now included with 3ds Max by default, has also been updated to support Fluids. The 3ds Max documentation also notes a list of smaller new features added in recent previous updates, including better handling of AOVs, and a thin-film iridescence control in the new Standard Surface shader. 3ds Max 2018.3 is available for Windows 7+. The software is available on a rental-only basis, with new subscriptions priced at $185/month or $1,470/year. “With 3ds Max Fluids, we took the same Bifröst engine that is currently in Maya but implemented that technology so it would feel familiar to 3ds Max users. “There are a few differences right now. In 3ds Max, we currently only support liquids, not the Aero functionality or the Bifröst Ocean Simulation System. 3ds Max also has some differences that aren’t in Maya. “For [an iterative workflow], 3ds Max solves multiple challenges. Each solve can have different settings that are stored in each particular solve. This allows for better iteration through a simulation. “Users can compare solves by selecting them: the corresponding simulations are displayed in the viewport. When a new solve is created, cache files are managed based on a token system set up in the caching tab.